You feel like making levels could be for you? You’re working on a mod project and know you will need to make a map for it, but you can’t seem to find a good start? 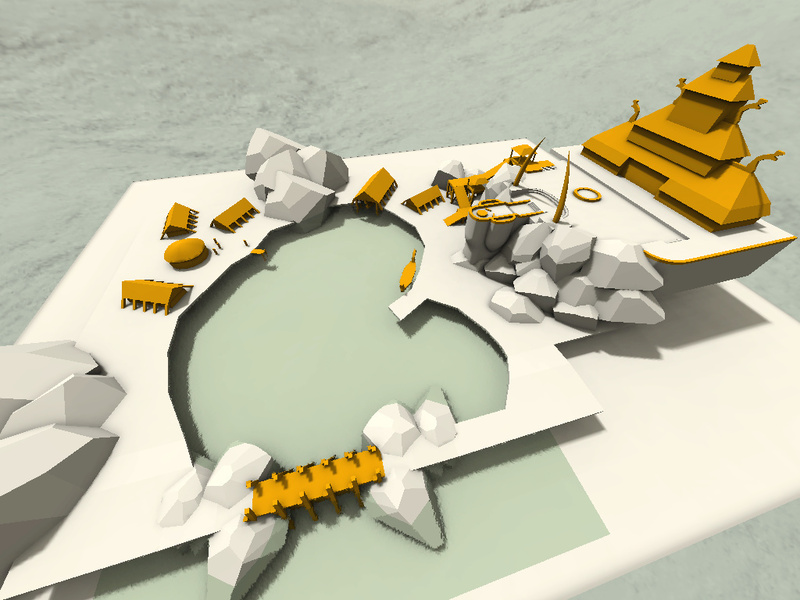 You have a vague idea for a level but it seems daunting to actually build it? 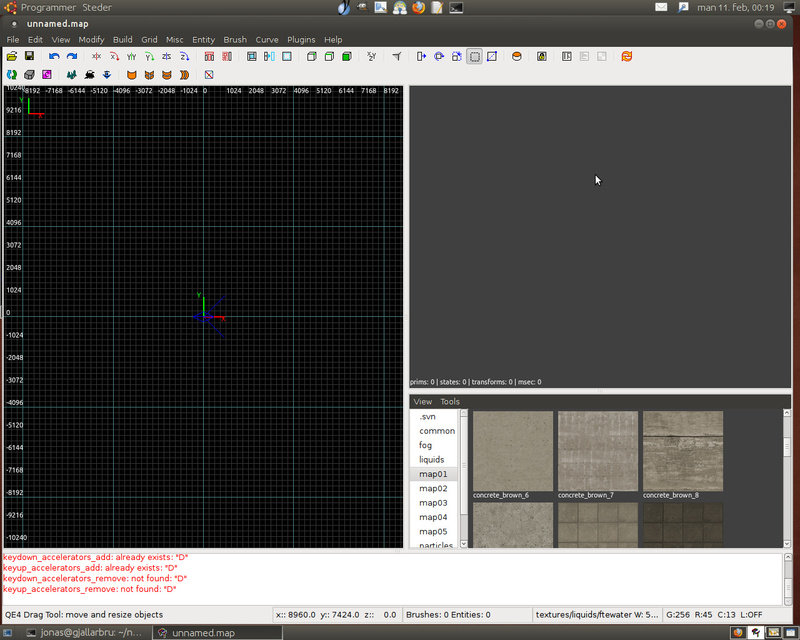 You have downloaded a level editor and maybe got it to load the textures, but now what? There is just an empty window staring at you? I know that feeling. I have spoken to others who felt the same way. You need to make a start somehow, to establish a nucleus of your level that you can then expand and embellish, and you don’t want it to be a box room with a light and a player start in it? Here are a few ways to get past that stage fright and make an actual start. First, close the level editor. Get a piece of paper and a pen. A large piece of paper (A3) is preferable, but a college block, the back of a napkin, anything will do. If you have a graphics tablet (I recommend Wacom Bamboo if you’re just starting out, they are affordable and they work), great – you might want to install Mypaint for freehand drawing, or you could just use whatever drawing software came with the tablet. But paper and a pen will do fine. Don’t ponder endlessly. Go ahead and draw it. So I draw it. I decide to draw in bird’s eye view – a top down layout. There you have it. A start is made, however stupid it looks. It is no longer a blank page, which is crucial. 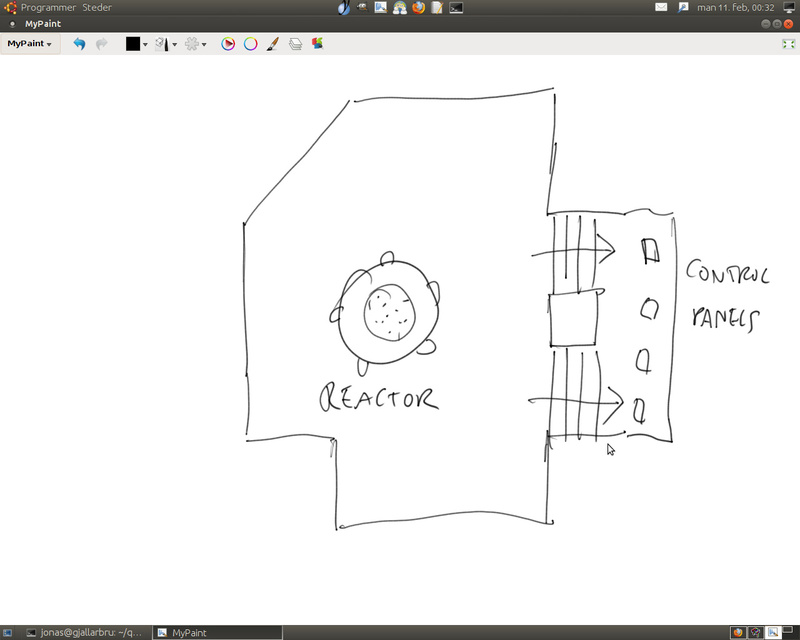 Next I assume there is a room around the reactor; please don’t draw box shaped rooms and feel free to add some rough detail. I draw a room that has one slanted wall and a niche separated by a pillar. I put a couple control panels in that niche and then decide that stairs left and right of the pillar would be a good thing. 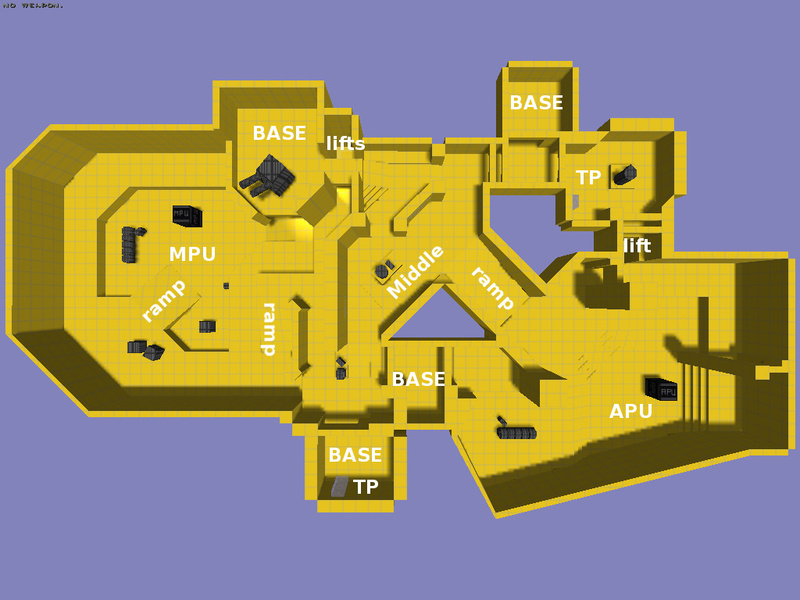 So I have already varied the floor height (that is a really good idea to do in every new area of your map). That’s my central room. When I build this in Radiant, I will just use a simple block in some garish colour to symbolize my reactor and the same goes for the control panels. But I guess one room is too little to make a level out of. 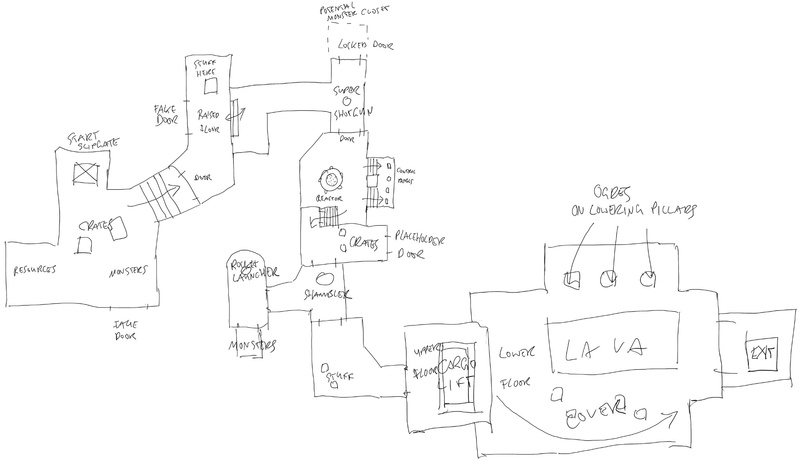 A typical level has a start and an end; so from the reactor room, I add a few corridor type things (please don’t just make straight corridors, try to have them angled or add little niches again) and one or two more rooms until I call it done and mark a big X to denote the level start. … and again put a pillar and a set of stairs in there. And because it’s all a bit simple looking, I make the connection to the next room angled and put a staircase into that, as well. I decide the room added after that is my start room, because I cba to make a bigger level today. To add interest to that room, I put a couple crates in the middle and spawn the player on one side of them, putting monsters on the other. I add another niche with some rewards in them (health kits or whatever). This is all done on paper; I haven’t touched Radiant yet, but I have a level. I add monsters by simply writing “monsters”. I add one or two more fake doors for good measure and then call the beginning of the level done. There is a T-shaped intersection which is often a good thing because it allows for branching. I put a rocket launcher in the short branch as a reward. Then there is a room with a lift; it is a really good idea to include lifts, ladders and other such things because it varies the height more than stairs do. This is why lifts are everywhere in e.g. DOOM. Behind the lift, I have a boss fight room with lava in it (liquids and hazards are also a really good idea to vary your level). The boss fight is three ogres bombarding you from the top of some lowering pillars (shamelessly stolen from DOOM). The player has the rocket launcher and a few crates as cover, so this should be easy. Then there’s the exit. That’s it. 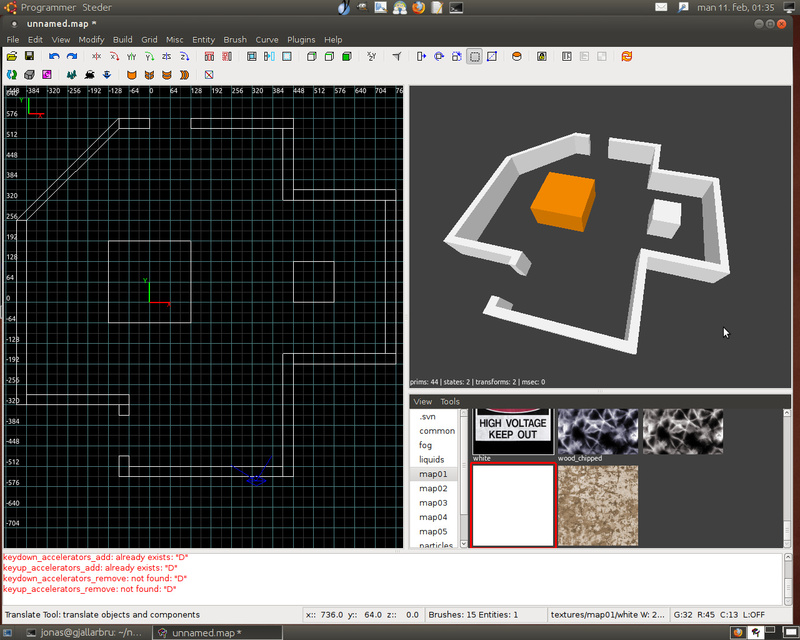 This won’t win any prizes, but I now have a complete level layout and I overcame the blank page. Personally what I would do is make one of the doors a gold key door, and add a branch of one or two rooms somewhere with the gold key at its end. 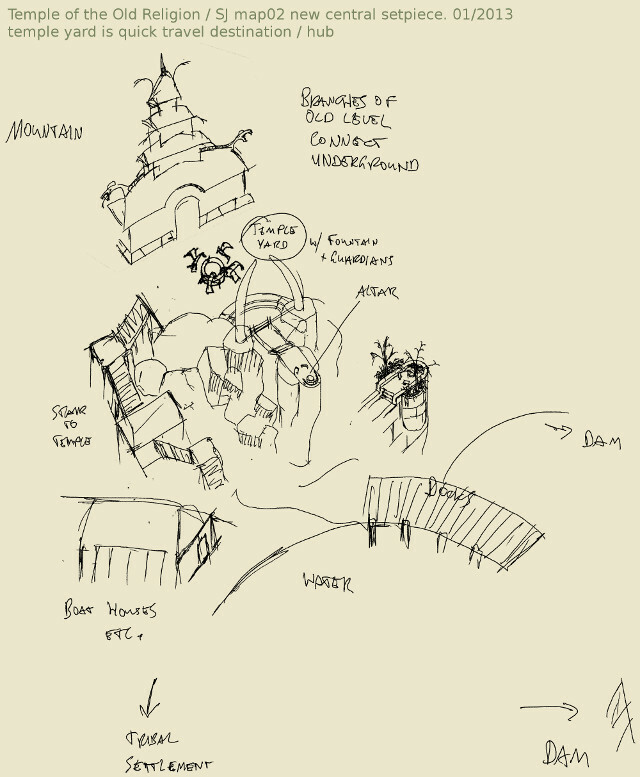 This would add some interest (and make the level a tad less linear). My reactor is an orange block (I make it 256×256 units since I know the player roughly fits in a 64×64 cube and still has some space around him; I want the reactor to be imposing). 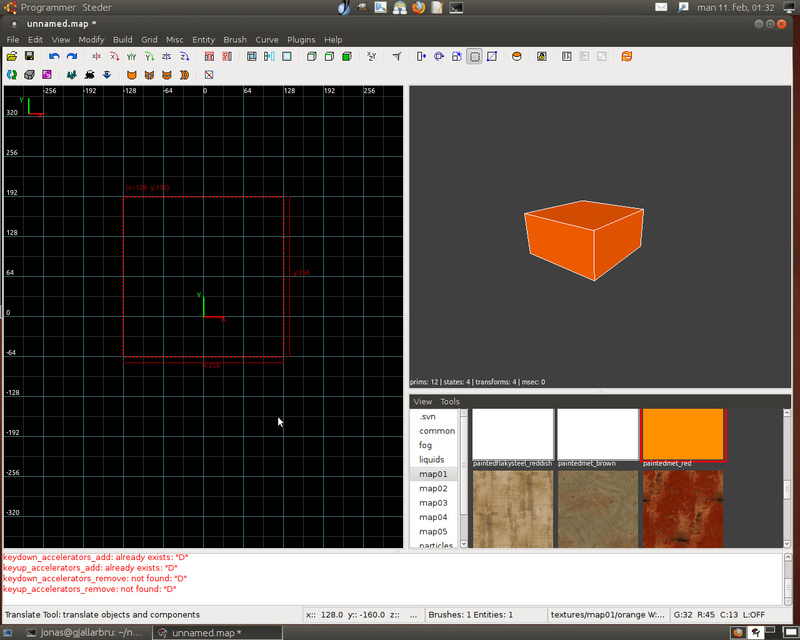 I can still make it taller, rounder, or even insert a custom mapmodel later; it doesn’t matter now. What matters is that it exists. 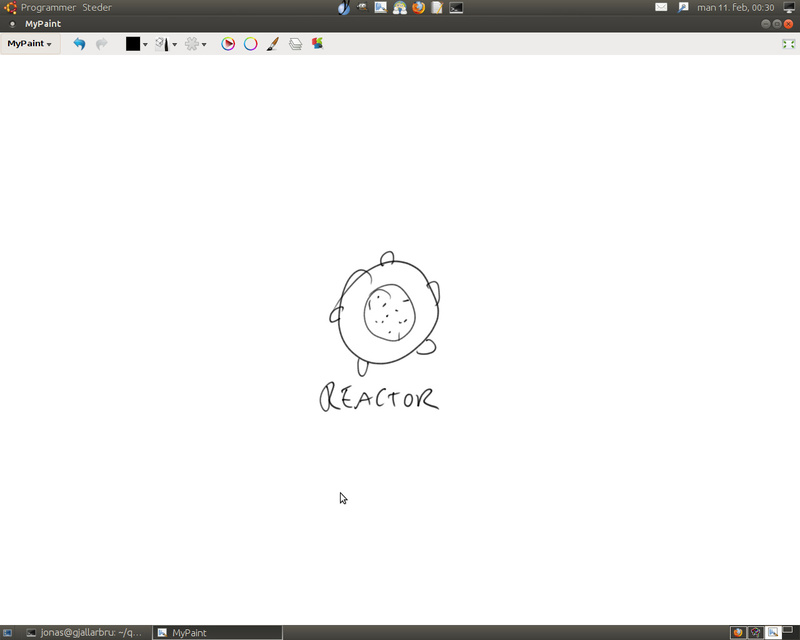 I build the reactor room around it (I just draw all the brushes in the overhead view, using vertex mode to angle them where necessary) using a flat white texture – you can use any similar texture here, such as Valve’s dev textures or a simple white TGA image. It doesn’t matter; what matters is that you get the size and shape of the room right. The trick is to build the walls first, not the floor. You can later adjust the height of the walls etc. The key word is “later”. Make sure your doors have a good size, I know the Quake doors have a width of 128 units so that’s what I roughly go by. Slightly wider is fine, too. A good width for a corridor is 192 units; smaller will seem narrow while bigger will seem spacious. But you can always fine tune this later. 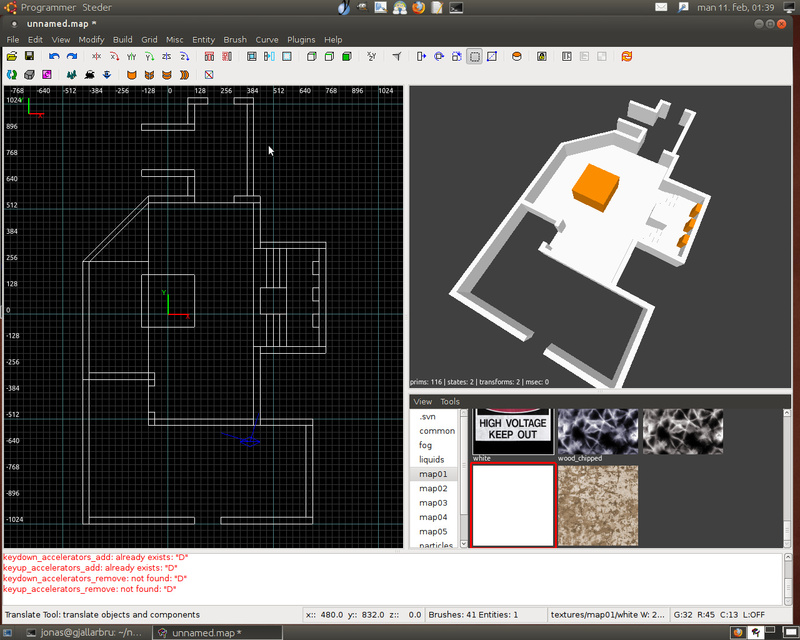 I continue building the adjoining rooms, always referencing my concept image. 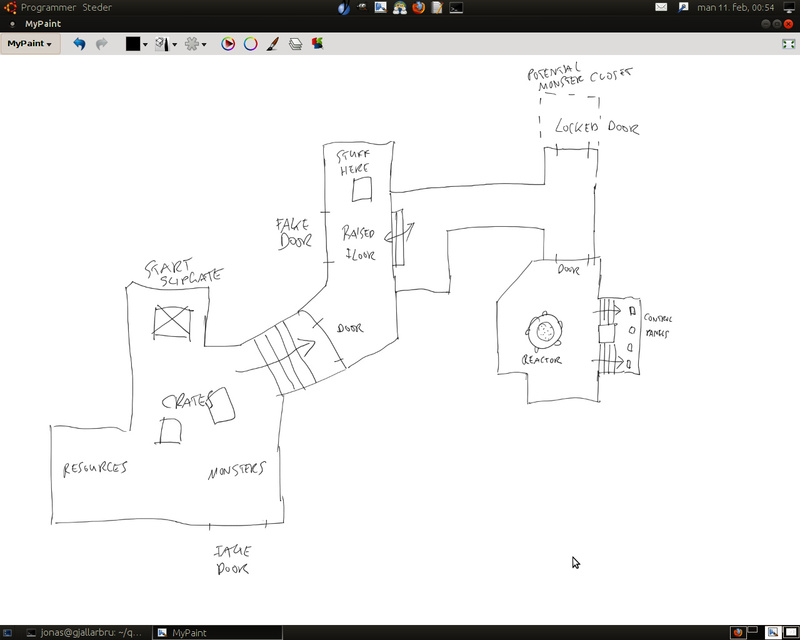 I put the floor in the reactor room, the pillar and the stairs, and then I put the control panels again as orange boxes. I could build the rest of the level in 5 minutes now, plus some extra time to put in doors and lifts, but I think you get the picture. You strictly follow your reference drawing and line out the walls, then you fill in the floors, doors, and eventually the ceilings. This could easily be a turtle map depending on the amount of detail and the prettiness of the lighting you put in later. But that’s not important in the beginning, you can cross those bridges when you get to them, what matters is that you get past the terror of the blank page and into a situation where your level actually exists. You can always prettify it later. Note: Don’t get hung up on details. You might get ideas for details as you go along; don’t start building them yet, unless it can be done very quickly. You want to lay down the entire thing first. Rather note the idea on your concept drawing. 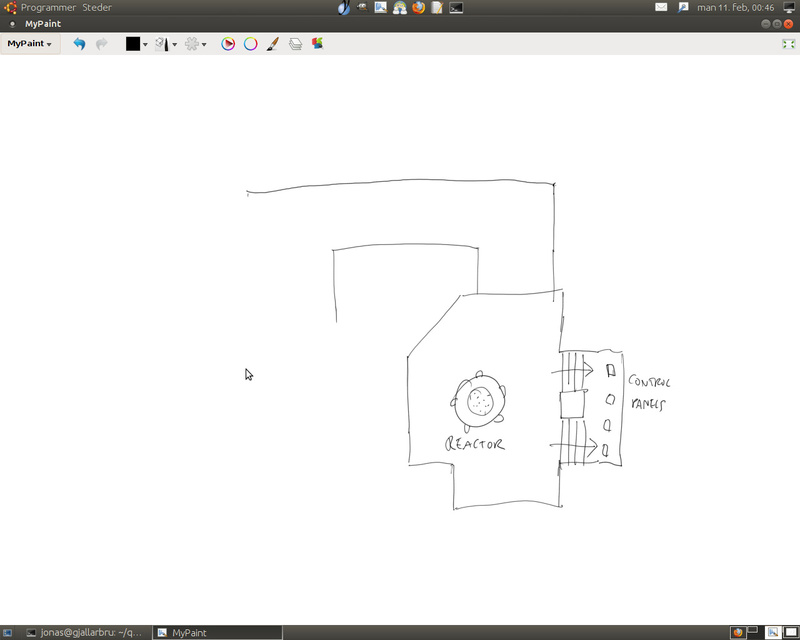 Note: Don’t make your concept drawing too elaborate. Try not to be overambitious with the size of your project; instead focus on actually getting it done and shipped. You can build more elaborate things some other time. A simple project that ships is preferable to an ambitious project that doesn’t ship. Note: Stop thinking in terms of “rooms and corridors”; instead think of corridors as just a different type of room, or think in terms of “areas” instead. A good level has various different ways to blend adjoining rooms or areas into each other. If there needs to be a corridor, at least make it interesting by having pillars in the middle, different floor heights, stairs, or having it wrap around some kind of prop on both sides. You know what I mean, right. Note: Try adding a second floor to some of your rooms. This can be as easy as putting in a brush to serve as an upper floor (try something like 192 units above the ground); you can then make a hole in the room at the same height so you have a door and connect that to the rest of your level via lifts etc. Perhaps have the upper floor cover only part of your room, or have it be a catwalk so you can post some sniping enemies on it. Try to have this second floor wind through several areas of your level. It will add verticality and playspace without requiring you to add completely new areas. In other words, a second floor is a good way to reuse existing areas for more playspace. This method works. Remember, the important thing is to get something, anything, actually made. So you get past that blank page and past that empty window. I don’t know why even sites like World of Level Design still teach people to build two box rooms and a corridor when they’re starting out. That is horrible. Get away from that as soon as you can. I hope this tutorial was helpful. Copyright (c) J. Nicolaisen except where noted otherwise.